Newsletter No.006 E200K, Data card address, C126 page. Hello again. Lots more interesting info this week. Firstly, we are happy to announce the birth of a healthy baby boy to Scott. Scott is our suspension and brake specialist mechanic. His wife and son are doing well. Daimler-Chrysler Asia Pacific (DCAP)has announced a new model to the E class line up. The E200 introduces a new high tech, high-efficiency supercharged engine that is destined to play a major role in its Australian operations. The new E 200 Kompressor has (as its name suggests) a supercharged 120kW four-cylinder powerplant. 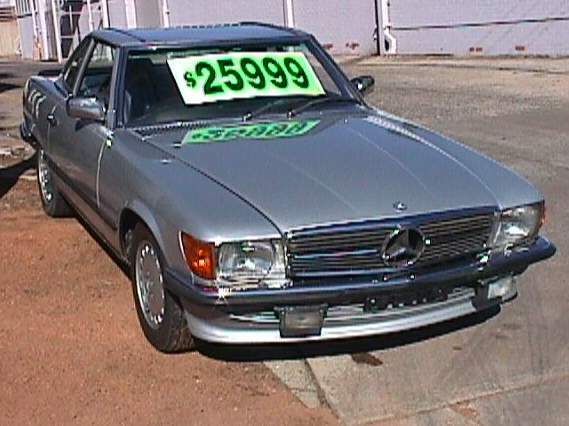 The value-oriented E 200K Classic becomes the entry-level for Mercedes' E-class range priced at $79,500. Have a look here for a complete copy of the recent press release by DCAP detailing the new model. Also there is a run down on the rest of the E class line up. This is a huge artical so go and make a cup of coffee before you start to read it. Do you have your Data Card? Not sure what a data card is? Have a look at this site for an explanation. They are not essential but are a handy thing to have with you car. Owners of Classic Mercedes-Benz vehicles can apply to the Classic Centre for a copy of the original data card for there car. It takes about a month for it to arrive after you request it. Here are the details of where to send your request. We have sold the 380SLC this week. The 560SEL has been to the detailers and came back almost looking like a new car! (if I was a true used car salesman I would have omitted the word "almost") Below is a picture of the 450SL that we have for sale. Here is a list of out current stock list. Check out our cars for sale here. Have a look here, maybe some of you checked this out from our links page mentioned in the last newsletter. The 560SEC was the biggest and best version produced in the C126 range made from 1982-9. Make sure you check out the crash pictures of "Bucks car" This is one hard hit! The passenger safety cell is perfect. This is especially obvious in the shots of the back of the car, the rear windscreen is not broken! For a laugh you could look at the "Freak show". The one that has a Corvette style front is real strange. Surely if you want a Corvette you buy a Corvette? After the huge response we have decided to rerun the special from last week. It will only be valid until Thursday the 31st. Here is a copy of the special from the last newsletter. This week we have a huge special for our newsletter list only. All of the following shockabsorbers have been reduced from $129.00 to $97.90. W110, W111, W108 front and rear. W114, W115 front and rear. W116, W126 front and rear (std version). And now the big one. We have brought a limited number of rear ride level struts to suit the W123, W116 and W126 sedan. These are normally $320.00 each and will be on special for $247.50 until sold out. If you have a leaky one now is the time to replace it. These sell for over $450.00 at the Mercedes dealers! These shockabsorbers are genuine SACHS units as supplied to Mercedes-Benz. Prices are each, not pair. Prices valid until the 31st of August or until sold out. Price doesn't include fitting. This week supplied by Ian Marshall who I might point out is a Melbournian. space putting you in an even more dangerous situation. you have of getting hit. 5. Never get in the way of an older car that needs extensive bodywork. are apparently not enforceable in the metro area during rush hour. even someone changing a tire. to test drivers' reflexes and keep them on their toes. 13. Seeking eye contact with another driver revokes your right of way. first, by whatever means necessary. eye makeup at 75 k/ph in bumper-to-bumper traffic. selection process for body shops, junkyards, and new vehicle sales. sucked along in the slipstream of the car in front. 21. It is an essential duty of the driver to preserve the life of his passengers. litre V8 with a crow bar in your lap.